EHNAC’s ePAP has positioned EHNAC as a nationally recognized accreditation authority for e-prescribing networks and vendors. 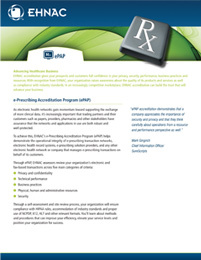 * These programs assess electronic prescribing transactions for compliance with industry standards and government regulations, and provide an organization’s existing and prospective customers with confidence that appropriate risk-based security and privacy controls are in place and key performance metrics are being met on an ongoing basis. Prepares your organization for third party audits including HIPAA/HITECH compliance audits that are now being conducted for the Office of Civil Rights (OCR); trading partner audits (some payers require EHNAC accreditation as a condition of processing their transactions); and state compliance (EHNAC accreditation is required for processing healthcare transactions in the states of Maryland and New Jersey). Demonstration of compliance with stringent Drug Enforcement Administration (DEA) regulations. Reduction of risk to PHI and operations through the demonstration of a risk management program with effective controls that appropriately minimize threats. Preparation for third party audits including HIPAA/HITECH compliance audits that are now being conducted for the Office of Civil Rights (OCR); trading partner audits (some payers require EHNAC accreditation as a condition of processing their transactions); and state compliance (EHNAC accreditation is required for processing healthcare transactions in the states of Maryland and New Jersey). Enhanced trust for your customers, trading partners, and other stakeholders. To begin the application process for the e-Prescribing (ePAP) program, please complete the application form through our website. Program criteria are located on the criteria page. UPDATE: EHNAC is one of five organizations currently approved by the DEA to be a certifier under this program. EHNAC is honored by this achievement and is pleased to join these other recognized certifiers. The full list can be found here. Also, are you looking for hands-on support to help you through the pre-assessment steps, readiness planning process and more? Learn about EHNAC’s Consulting and Advisory Services which have been designed to support the ePrescribing Accreditation Programs. – Adam Forman, Vice President and General Counsel Daw Systems, Inc.